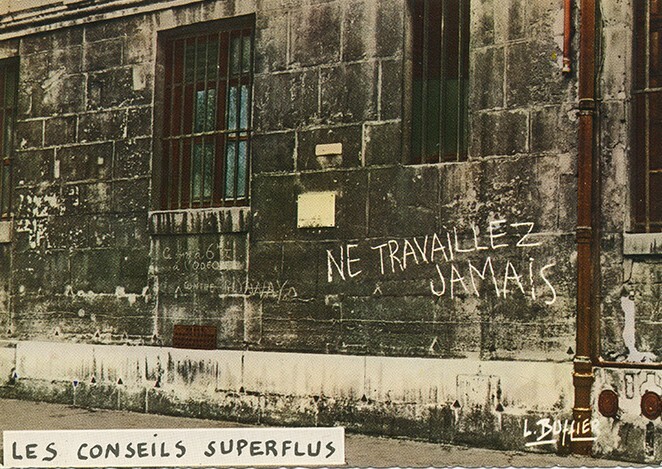 Louis Buffier, Ne travaillez jamais (Les conseils superflus), ca. 1966 | Courtesy Arsenale Institute for Politics of Representation. Between 1957 and 1972, the Situationist International (S.I.) first projected a “revolutionary front in culture” and then shifted its propaganda to the political field. Employing ludic methods, the movement offered a fundamental critique of the “spectacle” of a consumerist society. In an age in which the principles of the market economy are increasingly permeating all areas of life, The Most Dangerous Game instigates a new envisioning of the years in which the S.I. articulated its critique. The exhibition’s title refers to a lost collage created by one of S.I.’s co-founders, Guy Debord. The title recalls, on the one hand, the revolutionary earnestness with which the S.I. radicalized the debates of the postwar years, while, on the other hand, emphasizing the playful element that characterized all their diverse activities. Their ‘playing field’ was the city and everyday life. It was here that they sought confrontation with the bourgeois system – aesthetically through the “construction of situations”, and theoretically through precise analyses of modern consumerist society. The exhibition’s starting point is the Bibliothèque situationniste de Silkeborg, a venture that Debord drafted in outline with the painter Asger Jorn in 1959 for the latter’s museum in Denmark. At HKW, this project, which remained unrealized in its day, is for the first time reconstructed in its entirety. An Archive of Last Images presents examples of the paintings produced by the S.I., maybe the last avant-garde of the 20th century. Guy Debord, Jacqueline de Jong, Asger Jorn, J. V. Martin, Jørgen Nash, Heimrad Prem, Hardy Strid, Helmut Sturm, H. P. Zimmer | Untitled [Peinture collective situationniste], 1961, Courtesy Halland Art Museum, Sweden | Photo: Halland Art Museum | © VG Bild-Kunst, Bonn 2018. 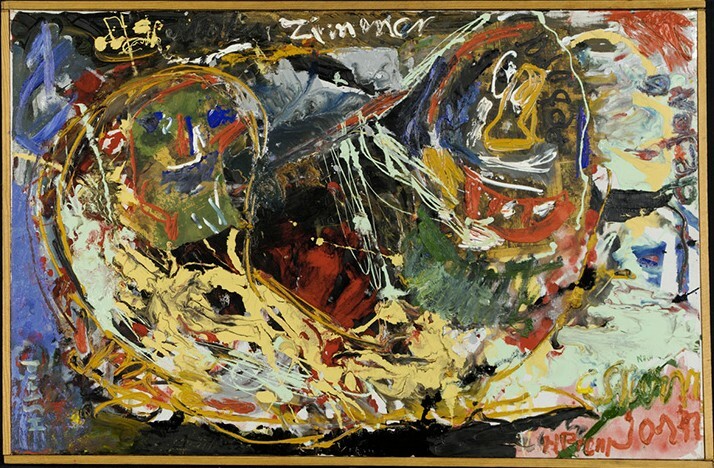 The exhibition thematizes the break away from art created around 1962 – when the S.I. distanced itself from those members who wished to adhere to a primarily artistic creative praxis – and follows the activities of the S.I. up to and including the May 1968 uprising in France, in which the S.I. played an essential part. The revolt was stifled after only a few weeks. Bourgeois society, however, appropriated the themes of the insurgent younger generation and subsequently subjected all areas of life – including sexuality – to capitalist ends and exploitation. The Most Dangerous Game at Haus der Kulturen der Welt ties into the discussion of Surrealism in the exhibition Neolithic Childhood. Art in a False Present, c. 1930, the remapping of post-war modernism in Parapolitics. Cultural Freedom and Cold War, and revolutionary Russia’s progressively aspirational melding of art and science in Art Without Death: Russian Cosmism. The exhibition The Most Dangerous Game draws lines that the project Bauhaus imaginista takes up in 2019, exploring the influence of and roles played by the Bauhaus in an international context. With works by Pierre Alechinsky, Karel Appel, Armando, Enrico Baj, CoBrA, Constant, Corneille, Guy Debord, Erwin Eisch, Ansgar Elde, Farfa, Lothar Fischer, Pinot Gallizio, Internationale Lettriste, Internationale Situationniste, Isidore Isou, Jacqueline de Jong, Asger Jorn, Jan Kotik, Laboratorio Sperimentale, Uwe Lausen, J.V. Martin, Giors Melanotte, Eva Renée Nele, Erik Nyholm, Panamarenko, Hans Platschek, Heimrad Prem, Ralph Rumney, Piero Simondo, Gruppe SPUR, Gretel Stadler, Hardy Strid, Helmut Sturm, H.P. Zimmer, Maurice Wyckaert and many more. A project devised by Wolfgang Scheppe in collaboration with Roberto Ohrt and Eleonora Sovrani. THE MOST DANGEROUS GAME is part of 100 Years of Now. Supported by the Federal Government Commissioner for Culture and the Media due to a ruling of the German Bundestag. Haus der Kulturen der Welt is supported by the Federal Government Commissioner for Culture and the Media as well as by the Federal Foreign Office.